The largest of the Balkan countries, Romania has dramatic mountain scenery and a coastline on the Black Sea to the East, and Hungary to the West. It has seen numerous empires come and go from the Roman to the Ottoman. A Latin country, it did not exist as such before 1859 when the German Prince Karl of Hohenzollern-Sigmaringen was called to the throne as the Ruling Prince of the Romanian Principate and in 1881 finally crowned as King Carol I, the first monarch of the Kingdom of Romania. Independence from the Ottoman Empire was declared in 1877 and the country fought with the Allies in the First World War finally throwing off the yoke of the Turkish Empire. At the start of the Second World War Fascist Dictator Ion Antonescu sided with the Nazis but was overthrown in 1944, with the Russians marching in soon afterwards. King Michael (still alive at 92 and a resident of the capital Bucharest) was deposed and it was not until the downfall of Nicolae Ceausescu in 1989 that true democracy began. Since then Romania has made rapid strides and today is a member of NATO and has been a member of the European Union since 2007. All restrictions on travel to and from the United Kingdom and Ireland will be lifted in January 2014. Over the last decade the country has seen good and bad economic times but you get the impression with new motorways, the latest cars and clean well maintained streets that the country is for the most part leaving bad times behind. In a visit that lasted just three nights it was impossible to really judge the country but they say that “first impressions count” and the first impression of Romania was very good, helped by the fact that English has overtaken French as the number two language. Sadly the nation, like most around the world these days, is totally engrossed with handheld pdi phones. From our small bus we watched as two people, completely absorbed in their devices, walked into each other. Bucharest has a fine modern Metro system, where fortunately the phones do not work (as yet). It was straight from the very modern airport to the Conacul Dintre VII Urlati, which calls itself a mini hotel with just 22 rooms. It is just one hour’s drive and seemingly in the middle of nowhere surrounded by farms in a totally rural environment. For the summer an outdoor swimming pool is available but now in the autumn the easyJet group were initially entertained (or educated) by a sommelier with a fine understanding of English. Romania has a very successful wine industry. And then to an excellent (flaming) Turkey dinner. Day two and to Sinaia “Pearl of the Carpathians” a ski resort in the winter but more famous as the summer retreat of King Carol, whose amazing palace is one of the greatest in the world and not to be missed. Perched on a hill overlooking the small town and river that runs through a valley, Peles Castle was completed in 1883 after 10 years and included central heating, electricity, personal elevators and a vacuum cleaning system, unheard of in those times. Peles is maintained to the highest standard with the exterior in a German Neo renaissance style with its 160 rooms furnished in various styles including Baroque, Rococo and Moorish. The armories collection is outstanding and the King was able to entertain guests in his own sumptuous theatre, early in the 20th century cinematograph facilities were added. 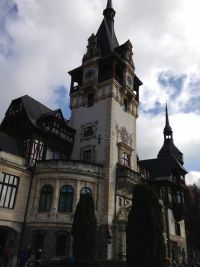 Sinaia is about two hours from Bucharest with a direct train service and also car coach/car along an excellent brand new motorway. Bucharest has been described as ‘Little Paris of the East’, a title fully justified and vindicated by the Triumphal Arch, in the city centre, more French than Roman and completed in 1922 to commemorate The Great War. Economically, Bucharest is the most prosperous city in Romania and is one of the main industrial centres and transportation hubs of Eastern Europe. It has first class convention facilities, educational institutes, cultural venues, traditional ‘shopping arcades’ and the latest multi-franchise malls, plus some excellent parks and recreational areas. Our two-night lodging was the excellent 59-bedroom Grand Hotel Continental www.grandhotelcontinentalsiena.com, laid out in a classic style and with all the latest facilities. Sited in the centre of the city it was quiet and to be recommended. easyJet Holidays have two night breaks including flights from £140 per person. Remarkable value. Most of the international hotel brands are represented in the city. Dinner the second night was at the Hanu Berarilor Casa Elena Lupescu www.hanuberarilor.ro, once the home of the mistress of King Carol II, and very well restored. It ranks as one of the ‘in’ places to eat in Bucharest. The ‘Dimitrie Gusti’ National Village Museum (on the Metro) is a cultural complex showing a world that has passed. Pleasantly sited on shore of Lake Herastrau it dates from 1936 and is a collection of 80 houses and infrastructure from all over Romania, and dating from the 17th century. Each region of Romania is depicted along the paths that connect the buildings, many of which are accessible. It is a ‘must’ for children, part of the history of the country, but overseas visitors will be pleased to learn that all the information boards are duplicated in English. Perhaps the highlight of the trip was a visit to the Palace of Parliament, said to be the world's second largest building, after the Pentagon. Created by the discredited President Ceausescu it is nevertheless a fitting tribute to the skills of the Romanian workforce that put the project together over a 10-year period during which a revolution brought in a democratic government. The Palace measures 270m (890ft) by 240m (790ft), 86m (282ft) high, and 92m (302ft) underground. It has 1,100 rooms, 2 underground parking garages and is 12 storeys tall. Today it is the home for both houses of the Romanian Parliament, its massive reception rooms also used for commercial presentations. The marble edifice is said to be earthquake proof. The trip did include a great deal of eating with lunch on the second day taken at the superb Joseph Hadad restaurant , the Michelin starred chef/owner, a religious Moroccan Jew, not the sort of person one would expect to run the finest dining establishment in Bucharest. Only one negative issue in Bucharest. Smoking still seems to the allowed in most public places (but not the Village or Palace) including some restaurants. Even the smokers in our group were disturbed. I am sure the rules will change in time.